There are a number of ways you can get started with your lifestyle redesign process. Which option is the best fit for you? The Lifestyle Design Studio is an online community for women who are ready to experience better health, more balance, and greater adventure. As a member of the Studio, you’ll learn how to use Living Upp’s 8-Dimensional framework to make simple adjustments to your current lifestyle so you can experience life differently. The Lifestyle Design Studio provides space for you to grow — both personally and professionally. Learn more about the Lifestyle Design Studio here. The Self-Care Starter Kit is best suited for independent learners who prefer self-paced learning and have no problem staying accountable to their goals. The kit includes a few basic tools to get started with your lifestyle design process. Within the kit, you’ll find: sample pages from The Self-Care Planner, training videos from the 8-Day Self-Care Challenge, a digital copy of Uppward: A Self-Care System for Purposeful Living, a Workbook to help you map out your personalized plan — AND, as a bonus gift, you’ll receive a copy of the eBook, My Year of Self-Care. Digital files will be emailed to you after purchase so you can get started right away. Learn more about the Self-Care Starter Kit here. Are you looking for a planner that can help you manage your personal and professional life all in one place? The Self-Care Planner* is designed to help you do just that! The planner’s clean, simple design offers structure without compromising space for creativity. You can organize your notes, make lists, create a vision board, track your goals, and capture your brilliant ideas as they come to you. Living Upp’s unique 8-dimensional self-care framework will help you learn how to identify your needs more quickly so you can invest your time and energy more efficiently. Learn more about The Self-Care Planner here. *Living Upp is a participant in the Amazon Associates Program, which means we earn a commission from qualifying purchases. The 8-Day Self-Care Challenge is a great option if you’re looking for some fresh ideas to incorporate into your existing self-care practice. During the challenge, you’ll be guided through a series of self-paced training videos designed to help you examine your self-care habits more closely. Each day of the challenge, a new training video will be delivered to your inbox. 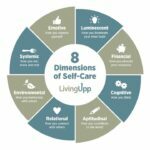 Learn more about the Living Upp 8-Day Self-Care Challenge here. Schedule a Strategy Call now!